Well. If you ever really wanted to know what it feels like to have your parade not just rained on but completely and totally soaked, you just found out the hard way. I say the hard way because it was hard to watch because it was painful because it lacked win particularly conspicuously. The only plus side of the entire night was the bright return of the Citgo sign after being out while approximately 218,000 lights were replaced with more energy-efficient and weather-resistant ones. That brief respite from utter disappointment occurred in the seventh, which was after most of the damage was inflicted, and you were thinking that the deficit isn’t so bad, so maybe we’ll come back in honor of the sign or for whatever reason. Nope. Lackey was utterly lacking. What a cliché pun, but what’s true is true. The man did not have it. Tito still trusts him as a big-game pitcher; ultimately, I can see why. When it comes down to it, Lackey’s signature is big games. He’s just having a hard time of it this year because it’s his first season with us. Next season will show his return to form. Meanwhile, he’s durable, capable, and competitive, qualities that make him a good starter, his line notwithstanding. But sometimes you can’t escape from the line. Unfortunately, last night was one of those times. Lackey gave up seven runs, six earned, on eight hits while walking two and striking out three. At first glance, his hit and walk totals may seem low, but after you consider the fact that he did that under five innings, you realize that he was on pace to have one awful night. In fact, he did, and he was removed before he could allow further damage to occur. But that didn’t change the fact that his most frequently used pitch, the cutter, wasn’t as sharp as it could’ve been. His curveball and slider were better. His changeup was extremely effective; all but a few were thrown for strikes. Unfortunately for us, man can not live on one pitch alone. Don’t even get me started on his fastball. He threw only seven pitches in the first inning. Seven. It’s like tuning in to a new episode of your favorite TV show, seeing a fantastic cold open, and watching everything go downhill from there, except you obviously can’t look away because you’ll miss all the details. His worst inning for pitch count was the very next one with twenty-three. That’s basically when you figured out where the night was headed. He finished having thrown eighty-three pitches, forty-nine for strikes. His command wasn’t there, he left pitches up, he hit batters, he misfired. He essentially did every single thing every pitcher knows never to do. Ever. And he managed to do them all in less than half a game. The bullpen was not helpful. After McDonald’s bobble, Bowden came on and allowed three more runs. Hill recorded two outs before Matt Fox allowed one. Wake was our only salvation, and even he couldn’t pitch through two and a third innings with a successful pickoff without allowing three hits. Finally the game was over, but the outcome wasn’t pretty. Part of why it was so disappointing was that the offense did everything right. The final score was 9-11. Not 0-11, not 1-11, not 5-11, and not even 8-11. 9-11. No team, and I mean no team, should lose when it scores nine runs. Nine runs should be a blowout win, not a close-call loss. Those nine runs were the product of a never-say-die attitude. We got started early when V-Mart blasted a two-run homer into the Monster seats in the first . Toronto tied it an inning later and scored five runs in the fifth inning alone, thanks in part to Lackey hitting his third batter to load the bases with nobody out for Overbay only to give him a changeup that didn’t do much of anything except stay up, and three more in the sixth. We answered in the bottom of the sixth with three of our own; Scutaro scored on V-Mart’s groundout, Beltre hit an RBI double, and Lowell hit an RBI single. Toronto took one back in the seventh, and we would have to score six more runs just to tie it. Time was running out, but it didn’t seem to matter. In the eighth, V-Mart blasted another two-run shot, launching a first-pitch fastball right over the Monster and into the parking lot for his third multi-homer game of the season. In the ninth, the kids went to work; Navarro hit an RBI single and Nava hit an RBI double. We only needed two more to win. With two out in the bottom of the ninth, we had the tying run at the plate. That tying run was Victor Martinez, who had already been responsible for about half our RBIs up to that point. At that point you’re thinking that, no matter what happens, the stage is set perfectly. No matter what happens, that is the exact scenario you want under those circumstances. So you could sense that the probability of something good happening was substantial. But we couldn’t do it. V-Mart took a 1-0 cutter and popped it up. The game ended there, and we took the loss. We erased the progress in the standings we’d made two days before and snapped our winning streak. It doesn’t matter. We lost. In the grand scheme of things known as the standings, he’s right. The standings don’t record individual at-bats; entry into the playoffs is decided by wins and losses. I don’t agree with him wholly because I think every run, every play, and every move made impacts where we go from here, and as a Red Sox fan I obviously believe that baseball should be dirt-dogged and played with heart and hustle no matter what the circumstances, but as for the despair that this statement expressed, I’m totally with him on that. Absolutely and one hundred percent with him on that. What makes matters inexpressibly worse is that the Yankees were in the exact opposite situation. They were one strike away from losing – not one out; one strike – when A-Rod obviously just had to hit a three-run home run. Honestly. I don’t think we’ve caught a major break all season long. Thus, I lay the responsibility of this loss squarely on the shoulders of John Lackey. Had he performed up to par, we would have been fine. Our nine runs confirm that there is no doubt whatsoever about that. And despite all that frustration, the only thing we can do is hope that Beckett shows the Jays who’s boss in game two. So that’s it. Let’s do that. Literally everything exciting in last night’s game happened in the eleventh inning. It was one of those tied affairs that you just had to wait out and see what happens. And it’s tense because the tie could swing either way. There was a time when you were confident that the tie would swing our way because our offense and bullpen were both solid beyond question. Currently, our offense and bullpen are solid, but being that an entire third of our starting lineup is out for the season, I’d say we have a good amount to worry about. For the most part, Dice-K was stellar. He tossed a full eight innings which was an extremely welcome break from Lester’s sad excuse of a performance. He gave up four runs on nine hits while walking three and striking out eight. He threw 109 pitches. His fastball, slider, curveball, and cutter were all working with some nice movement. His changeup still needs work but he only threw about four of them so it didn’t feature prominently. He gets points for going deep, lasting past five in his last thirteen starts, and only giving up four runs. But he loses points for earning a no-decision instead of a win because he gave up our lead, partially through giving up a two-run home run to Overbay. In the third, McDonald walked, Scutaro doubled, and Drew was hit to load the bases, and V-Mart singled in two runs. In the fifth, V-Mart turned a full-count fastball into another RBI single. Beltre’s bloop single added another run. In the fourth, we thank V-Mart for limiting the damage to one Jays run and not two by holding onto the ball at the plate through the collision with Overbay. We were up by three before yet another return of the one bad inning. It was the sixth this time. Dice-K gave up three runs on nineteen pitches, which is pretty economical considering his past pitch counts during his bad innings. And it was a real shame; he mowed right through the Jays before and after that but for some reason had to fail at locating that pitch. We could have sent everybody home in the eighth. Escobar dropped Lowell’s routine popup, which ended up in the stands, so Lowell reached second with nobody out. But Hall and McDonald struck out and Scutaro grounded out. 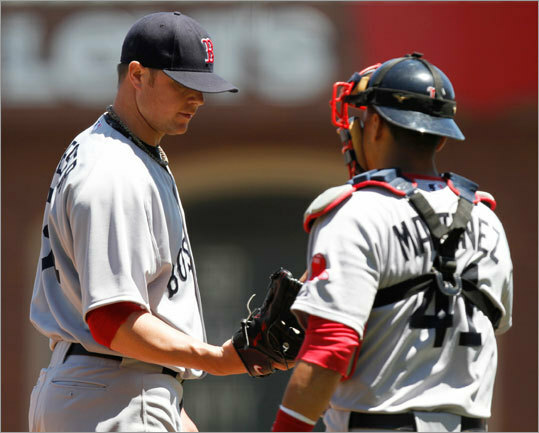 Fortunately, all the relievers who cleaned up Lester’s mess got the day off last night because we used only Bard and Paps, who both pitched well and held down the fort. But Bard had to toss two full frames, so he’ll probably be unavailable today. And now we come to the theatrics of the eleventh inning: a walkoff home run from one of the most unlikely sources in our lineup. In the top of the inning, Lowrie made a very strange fielding error. He stood under a popup waiting to catch it and just didn’t catch it. There was no wind; I think he was just slightly out of position. So it proved, thankfully, to be consequential, but it was just bizarre. But he made up for it; he used all the power and extension he had to send a hanging curveball over the fence in right! It’s his first career walkoff homer and third homer of the season. Clearly those hours in the weight room have paid off. He is currently in the middle of a career-high nine-game hitting streak during which he’s batting .357 with three doubles, seven homers and runs, and five RBIs. V-Mart improved his already strong average against Romero by going three for five. Scutaro also went three for five for his third consecutive multi-hit game and is currently in the middle of an eight-game hitting streak during which he’s batting .406 with four doubles, six runs, and three RBIs. Drew went two for three. And so it was good. It turned out alright. The bullpen got a rest, we got the win, we had three multi-hit games in the lineup, and we can be happy about that. We need every hit, every run, and every win that we can scrape together. So there’s nothing to do now but do it again. I can not believe we lost that game. I seriously can not believe we lost that game. That falls squarely on the shoulders of the bullpen. The starter did his job by limiting the opposition and keeping us in it. The offense did its job by scoring runs and putting us in a position to win. All the bullpen had to do was record three outs. Only three outs! And they couldn’t even do that! They imploded completely and managed to erase everything we’d worked for in the entire game in a single inning! And by “they,” I mean specifically Jonathan Papelbon. He’s been pitching so well lately, but this one is on him. The frustration that I experienced, and am still experiencing, is of epic proportions. We had the sweep in line. We had it in the bag. And the bullpen, pun intended, completely dropped the ball. Lackey was superb. He pitched eight full innings, gave up three runs on eight hits, walked one, and struck out four. His efficiency was perhaps the best it’s been all season; he did all that on only ninety-eight pitches, sixty-six of which were strikes for a strike rate of about sixty-seven percent. That’s very impressive. So were all of his offspeed pitches; his cutter, his most frequently used pitch, was very on, as were his slider, curveball, and changeup. His fastball was decent. And he just cruised. He threw seventeen pitches in the first, thirteen in the second, ten in the third, nine in the fourth, and never looked back. He got into trouble in the fourth too; he had runners at the corners with nobody out and managed to escape with only one run and nine pitches because even that one run was scored while a first-pitch double play was made. The exact same thing happened again in the sixth inning. 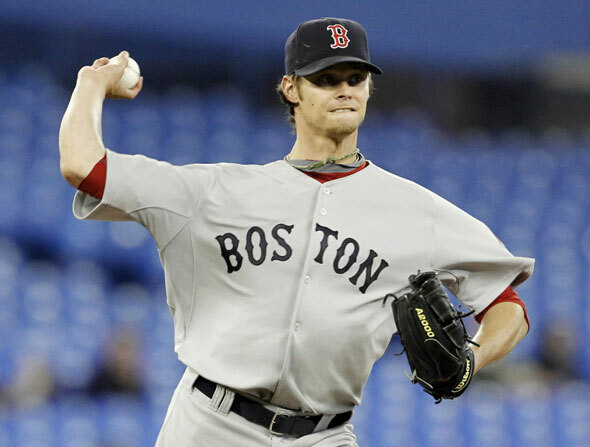 Like Buchholz, he was mowing right through the Blue Jays and making it look really easy. Meanwhile, the offense was right behind him the whole way through. 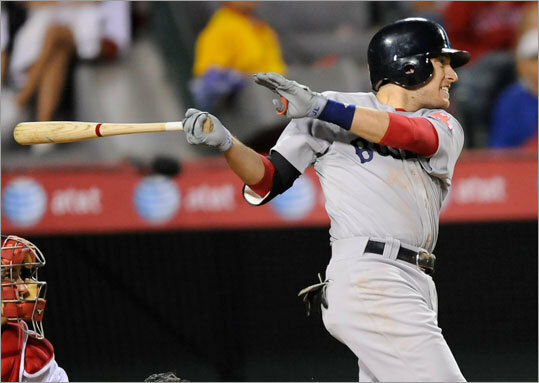 Ellsbury led off the game with a single, Lowrie followed with a walk, a double steal moved both of them into scoring position, Ellsbury came home on a sac fly by V-Mart, and Lowrie came home on a single by Papi. The fifth was a flashback to Wednesday’s heroics. Lowrie and Papi both went deep. Lowrie had us fooled the whole way. He lifted a high changeup, and it just kept lifting until it got out, but off the bat it didn’t look at all like it had enough to get out. That’s his first homer of the season, and, landing in the center field seats, it was very powerfully hit. There was no question about Papi’s homer. That left the bat and you knew it was headed straight for the bullpen. It was a changeup again. No wonder Mills was chased. That was Papi’s twenty-fifth home run of the season, giving him seven consecutive such seasons, which ties Jim Rice for second in the franchise. Ted Williams is of course first with fourteen. Double that. Ted Williams was the greatest hitter who ever lived. In the eighth, McDonald tripled in Saltalamacchia. By the way, Salty did very well in his debut; he finished the day two for four with two doubles and handled Lackey very nicely. Lackey didn’t even leave the ballgame until the ninth inning when, in search of his first complete game of the season, he led it off by allowing a home run. But life was good. We had a 5-3 lead, we were in the ninth inning, and we were handing that lead over to a bullpen that had recently handled much smaller leads against much tougher opponents. What could possibly go wrong? Plenty. Too much. Way too much. After Lackey left, Paps took the ball as is customary. But his appearance would prove to be anything but customary en route to blowing his sixth save this season in thirty-five opportunities. It was because he left all of his pitches up. That’ll do it every time. You absolutely can not throw lethargic pitches and then leave them up with the game on the line. That is a complete recipe for disaster. The first batter that Paps faced doubled. An RBI single followed. Then came a grounder off Paps’s left foot that bounced away, and Paps had no idea where it was, and the runners took the corners with nobody out. But this time, there would be no first-pitch double play. Paps struck out Snider, but that was merely setting up false hope. The very next batter hit an RBI double to tie the game. Then, with runners on second and third, Paps intentionally walked Overbay. Then he promptly handed the ball to Bard with one out and the bases loaded. To review, Jonathan Papelbon, our closer, not only blew the save and took the loss, but he left in the ninth inning, with the bases loaded, and the game tied, and handed the ball to the setup man. I mean, what? Never before in his entire career has Paps walked off the mound in the ninth in a tie. Unfortunately, it didn’t stay tied for long. Lewis hit a sac fly for the walkoff. And that was the only time the Jays enjoyed a lead in the entire series. But that’s a bad time for the Jays to enjoy a lead because that lead was permanent. And I refuse to say that Bard entered an impossible situation because he has entered that situation before, and in New York no less, and gotten out of it. A win would have swept Toronto. A win would have cut our deficit in the Wild Card standings. A win would have kept pace with New York. And we had that win. But then we didn’t win. We lost. We lost the day before we start a three-game set with the Rangers. One thing’s for sure: we absolutely can not afford to have this win slow us down. We can’t. Not when we’re facing the Rangers for three games on the road before a day off and a homestand. We absolutely can not. Tonight is yet another must-win, and it is essential that we get it back together and win us a ballgame. Beckett’s got it. What did I tell you? I said that Clay Buchholz is currently an ace in the hole. Last night, he proved me right. I hate to say, “I told you so,” but not when being right means we win. 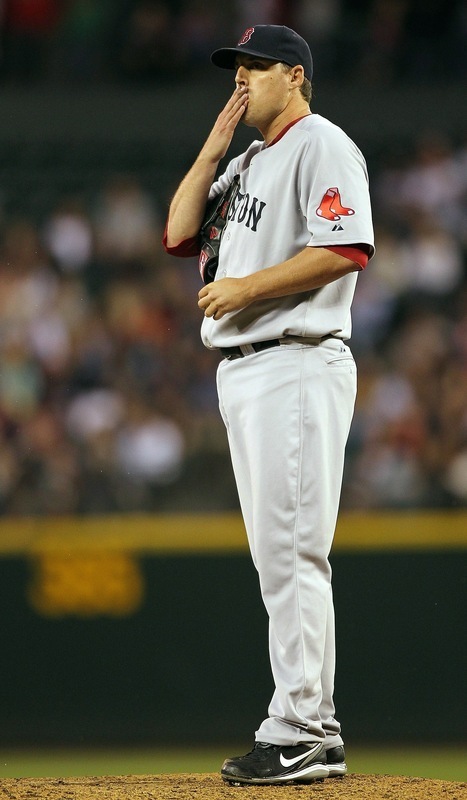 Clay Buchholz fulfilled a big responsibility last night, despite his age and despite his usual MO. He did two very, equally important things: he gave the bullpen a rest to recharge and he won us the ballgame. And I can say that absolutely because it was a pitcher’s duel, not a slugfest. 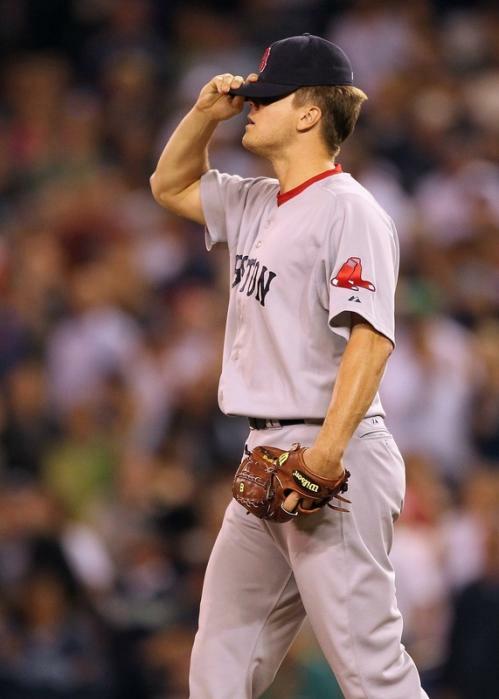 And Buchholz won out, besting Shaun Marcum to carry home the W. Buchholz pitched eight innings. Eight. He threw 117 pitches, eighty of them strikes. One run on seven hits, two walks, and four strikeouts, three swinging and one looking. He now has an ERA of 2.19 and a WHIP of 1.30. This was undoubtedly his best outing of the season, and one of the best of his career. No, seriously. His next-closest pitch count was 115, which he threw on September 1, 2007 during his no-no. Ladies and gentlemen, we just witnessed the return of the kid who threw the no-no. If there was an off-speed pitch that can be thrown in baseball, he threw it effectively. Maybe a handful of his breaking balls stayed up with righties at the plate, but that’s really the only complaint. A singe and double in the first resulted in the Jays’ lone run, but that was it. His two-seam and changeup were stellar. His command was fantastic. He worked calmly and efficiently and alertly; how about that line drive right into his glove in the second? He got the job done better than any of our starters this season. I think that was our best outing from a starter so far, period. Ramirez followed that spectacular performance with one of his own. A clean, one-inning, eleven-pitch save. Finally. We manufactured our two runs ourselves; for the offense, this was really a grind-it-out type of contest. In the first, we tied it when Ortiz worked a two-out walk, and he came around to score via singles by Beltre and Hermida. Lowell worked a four-pitch, bases-loaded walk in the eighth. My, that’s embarrassing. That is the absolute worst way for a pitcher to lose a ballgame. Trust me, I know. Eric Gagne was an expert at it. In the eighth, Wells singled and reached second on Beltre’s throwing error. He clutched at the ball twice before firing wide to first. That could have been it. But naturally Buchholz caught Overbay looking at a four-seam and got Gonzalez to fly out on an off-speed. We have good news: Ryan Westmoreland was released from Spaulding Rehabilitation Center on Saturday. He’ll continue rehabbing as an outpatient. He’s doing well, which is a relief. Hang in there, buddy. Embree is coming up to the bullpen from the minors today.